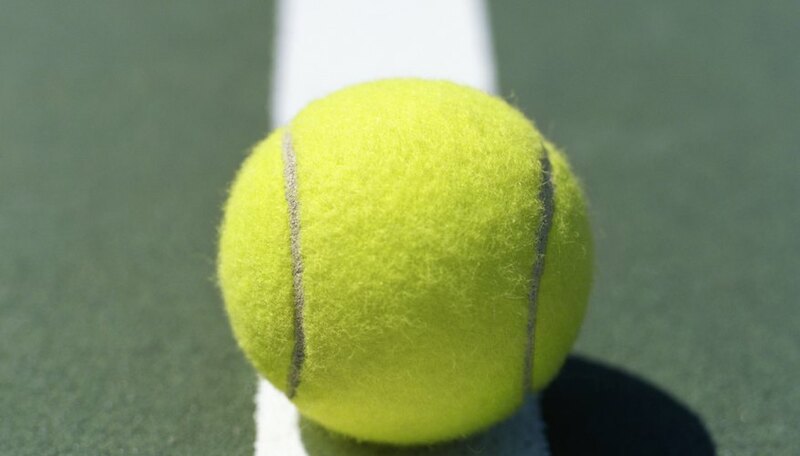 A tennis ball is a hollow rubber core that contains pressurized air within it. When it falls to the ground, the air within the ball expands and this causes the ball to bounce back. Changing the temperature of the ball affects the pressure of the air inside the ball and, in turn, the height to which it bounces. A science project that studies the effect of temperature on bounce is an interesting way for students to learn about this effect. Select a hard surface such as a tennis court or a concrete floor to perform the test. Make sure you use balls of the same condition to test the effect of heating and cooling on the bounce of the ball. Controlling this factor is important to prevent the nature of the ball from influencing the results. Preferably conduct the experiment in a closed space to avoid the interference of the wind on the bounce of the ball. Procure six tennis balls, electrical tape, sealable plastic bags, a tape measure that can measure up to 100 inches and a strong chair. You also need a thermometer that can measure temperatures ranging between 40 and 120 degrees Fahrenheit, a heating pad and a small ice chest filled with ice. Have your notebook and pen ready and ask a friend to assist you to note down observations during the experiment. Wrap three of the tennis balls in the heating pad to heat them. Put three balls into the sealable plastic covers and place them into the ice chest containing ice. When you are ready to begin testing, place the thermometer on the ball surface and note down the ball temperature. Quickly stand on the chair close to the tape measure, position the ball at the 100-inch mark and drop the ball down. Watch the point on the tape measure to which the ball rebounds and record this height. Repeat this for each of the hot and cold tennis balls. Collect a minimum of 10 readings for each ball temperature. Add the 10 readings you obtained for a given temperature and divide this value by 10 to obtain the average height to which the ball bounced at that particular temperature. Repeat this for the different temperatures at which you measured rebound heights. Plot a graph with temperature on the X-axis and bounce height on the Y-axis. Analyze your data to arrive at the results of whether hot or cold tennis balls bounce higher. Repeat the experiment by using balls of different quality. For example, if you used new balls the first time, try the experiment with old balls or balls of a different brand. Compare these results with your previous findings. BBC Sport Academy: Having a Ball at Wimbledon! Stewart, David. "A Science Project Using Cold Vs. Hot Tennis Balls." Sciencing, https://sciencing.com/science-project-using-cold-vs-hot-tennis-balls-12026623.html. 24 April 2017.